Yesterday I stated that the hostage rescue by Colombia's military has changed the political landscape in South America. Last Wednesday Investor's Business Daily looked at some of the actors. 1. Colombia has undermined the FARC to the point of having it on the run, killing its top leaders, and infiltrating its topmost ranks. At its height, the FARC controlled over 30% of Colombia's territory and terrorized the entire country. Colombia is about to end its decades-long civil war, and the good guys are winning. While the really hard work is about to start - i.e., ending the stranglehold of the cocaine trade - the victory opens the possibility that that, too, can be attained. 2. 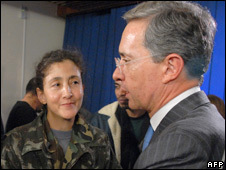 The FARC started as the military wing of the pro-Moscow Colombian Communist Party and has remained aligned with Communists in Latin America, including Hugo Chavez. This is a blow to Communism in Latin America. To use Esteban Lijalad's words, "Today Che died". 3. Appeasement never works, and the only way to defeat terror is through relentless, calculated, strategic, effective force. This carries great implications not only for Colombia and Latin America, but also on the war on terror. "agradezco los esfuerzos de Chavez, pero debe saber que los Colombianos elegimos a Uribe, no a las FARC". (my translation:) "I appreciate Chavez's efforts, but he should learn that we Colombians elected Uribe, not the FARC." The Israeli consultation was focused mainly on intelligence issues, special operations and integration and coordination between different security elements. This was in order to prepare them for a coordinated and productive campaign within a short period of time. 6. However, it can not be emphasized enough that it was the Colombians themselves who actually planned, executed, and succeeded in a months-long operation, and who will continue to do the heavy lifting. The mission would require near perfect execution by a military that only a few years ago could rarely be trusted. That is a hugely significant development, both in the symbolic sense, and in the strategic implications. It marks a new stage in the history of Latin America. As to the rumors circulated by Swiss public radio and their unnamed sources, clearly the Swiss should stick to reporting on cuckoo clocks. Daniel casts a jaundinced eye on the Swiss. Translation: Please credit me if you use this translation. Thank you. 13:23:00 [Voice off camera] "...from this side... hold...hold...backlighting...backlighting..."
13:24:00 [Reporter, now in front of camera, approaching man in long-sleeve t-shirt] "Commander, may I ask you only one question?" [FARC commander] "No, no, there's a rule and I'd be violating a rule." [Reporter] "Allow me, only one question. Only one question, yes?" [Reporter] "But it'll be too noisy. Let me ask you a question, so it shows." [FARC commander] "No, it is..."
[Reporter] "Real easy one, Commander." [FARC commander] "It's against the rules." [Reporter] "Commander, one question, please." [FARC commander, laughing] "No, it'd really be a mistake for me to give a..."
Camera zooms to the hostages: man wearing black t-shirt, Ingrid Betancourt wearing hat, tall man in sleeveless t-shirt & baseball cap. [Reporter, again off camera, while the tall man's hands are tied] "...of prisoners at the hands of the Colombian Revolutionary Armed Forces [i.e., the FARC]. the people's army. We'll have the chance to talk with the three Americans being held by the Colombian Revolutionary Armed Forces. On politics, we can't talk about politics. Get closer [to the tall man], get closer." [Reporter] "On politics, we can't broadcast, we can't have the group of prisoners at the hands of the Colombian Revolutionary Armed Forces, we can't..."
13:27:45 [Hostage with mustache, approaching reporter] "Yes, excuse me. I only have one thing to say: I have been chained for ten years. I am Lieutenant Malagon, of the glorious Colombian National Army, [voice breaks] kidnapped for many reasons by this guerilla." 13:28:01 [Reporter] "Words by Lieutenant Malagon. We can't broadcast them directly, we can't quote them but we know the suffering." [Lt. Malagon] "They should be broadcast, because I have something very important to state...."
13:29:12 [Reporter] "We understand, but the restrictions, the press is restricted, it's not allowed." Once in the helicopter, Betancourt crying, hostages laughing, hugging, thumbs up. Betancourt & other hostage holding each other. Helicopter noise, unintelligible voices. [Man's voice] "My God, man, thanks." [Betancourt] "Let's give thanks for this moment." [Man] "Who do you give thanks to, mother?" [Man] "I always expected this, always. Ten years waiting! Ten years expecting it!" Welcome, Power Line, American Power, Dr Melissa Clouthier, Conservative Syndicate, Irish Spy and Belmont Club readers! Because of the dramatic execution of this rescue, there will no doubt be a movie. A good counter to "Black Hawk Down", wouldn't you say? It also brings SA front and center on the international stage, which is important. It has too long been neglected. BTW, our commenter is Portugese and has trouble with translation...I realize now that it's Bolivarianism in English. Nice to see the good guys win one finally, and thanks for the translation, Fausta! Stand by Fausta...I hope to send a lot of Lizard traffic your way! Thank you Macker! I appreciate it. I've got some stuff up on this as well, and your list of impications is awesome. New Year Wishes to All! !